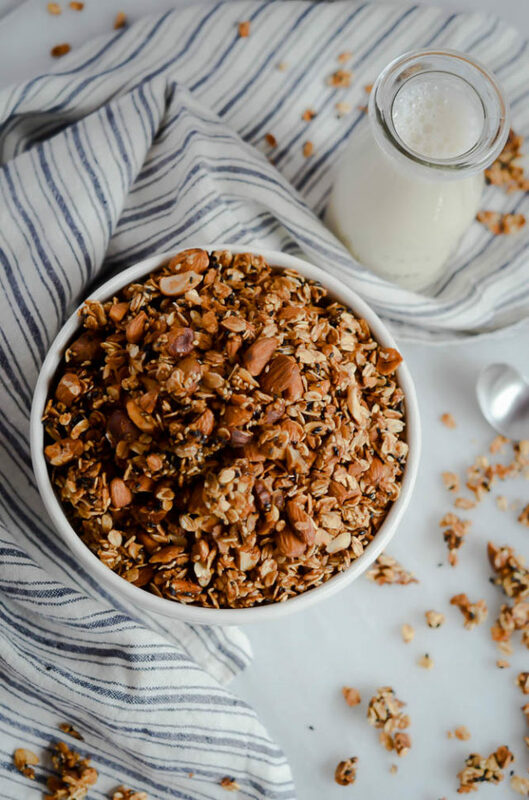 This easy granola recipe is the perfect thing to have on hand for hurried weekday breakfasts or to give as a homemade gift. It’s a crowd-pleaser! I’m a cookbook hoarder. There, I said it. I LOVE cookbooks. To me, there’s nothing quite like getting a new cookbook and leafing through all of the recipes, casually dog-earing (or sticky-noting) all of the recipes you want to try. There are so many amazing ones out there these days, and I can’t seem to keep up. In fact, it’s amazing how much effort I have to put into actually walking over to my bookshelf to my collection, grabbing a cookbook, and actually choosing a recipe to try. I’m the type of person that gets easily overwhelmed with so many options and ends up just wanting to get into the kitchen and do my own thang. That all being said, with the rarity that I actually cook something out of a cookbook, it is even MORE rare for me to find a recipe in a cookbook that I want to make over and over (and over) again. Enter Andy’s Fairfield Granola, which I stumbled across in Nigella Lawson’s FEAST: Food to Celebrate Life cookbook. I originally made this recipe when I lived in Napa, and I’ve continued to make it whenever I’m looking for a yummy granola recipe. 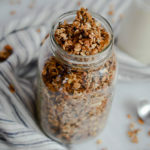 I have seen SO MANY delicious-looking granola recipes on the inter-webs and from fellow food bloggers, but I can never quite seem to pull myself away from this one. 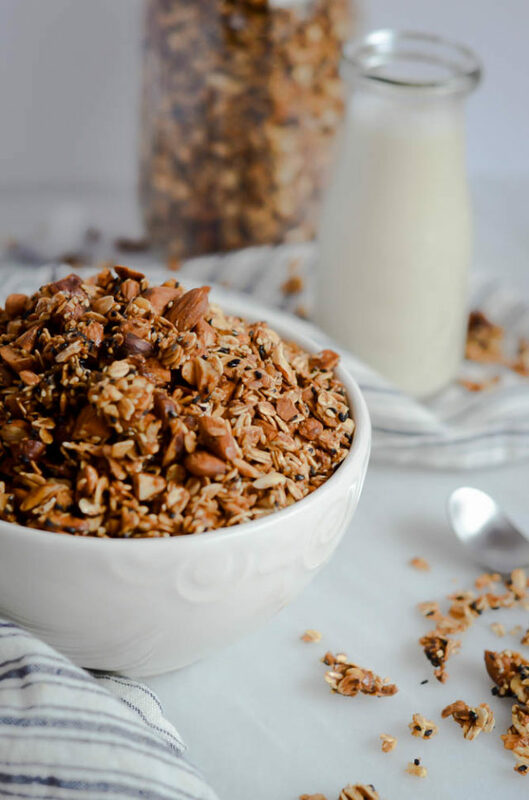 Nigella herself states that she stumbled across this granola while visiting a deli called The Pantry in Fairfield, Connecticut, and after tasting it she just HAD to have the recipe. She contacted the supplier, Andy Rolleri, and he happily sent it along to her. I have made a few tweaks to the original recipe from the book, mostly for the convenience of using whatever I have in my pantry, so this recipe is not exactly like Andy’s, but I still must say you will not be able to stop eating it. We are heading to Yosemite next weekend and I’m so excited to bring a couple of mason jars of this along with us. It will make the perfect camping snack! 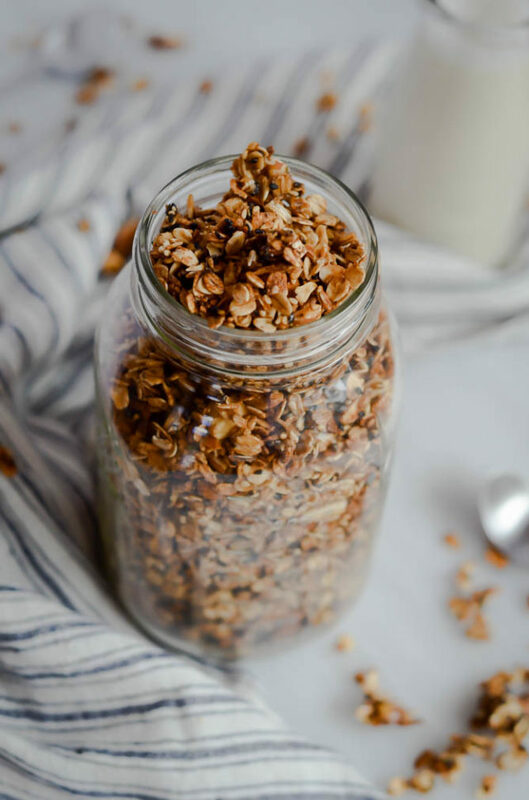 This easy granola recipe is the perfect thing to have on hand for hurried weekday breakfasts or to give as a homemade gift. It's a crowd-pleaser! Preheat oven to 310 degrees Fahrenheit. Mix everything except the raisins together in a large mixing bowl. Spread the mixture out on two jelly roll pans (baking sheets with edges.) Bake in 310 degree oven for 45 minutes. About halfway through the baking time, stir the granola so everything cooks evenly. You want everything to become a nice golden color without anything getting too brown in one place. Once baked, allow to cool. Mix in the raisins. Store in airtight container.